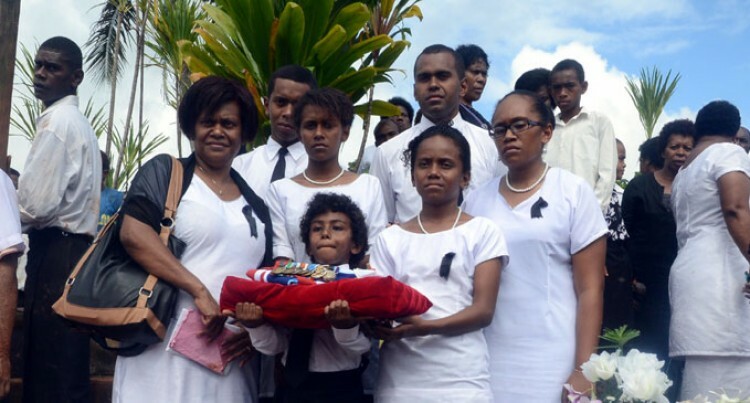 Tributes flowed yesterday as senior Republic of Fiji Military Forces (RFMF) officer Lieutenant-Colonel Amani Suliano, who died last week in China, was laid to rest at Nayavu Village, Wainibuka. Eulogies during funeral service at the village church spoke of a faithful soldier and son of Nayavu and a loving father. His wife, Lia Daukamakama Suliano, said after the funeral that she and the family had accepted his unexpected death. “What really hurts is that he never said goodbye to me and the family,” Mrs Suliano said. She said life for the family would go on. His eldest son, Vueti Suliano, said they would continue from where his father left off. Vueti is a member of the RFMF Territorial Force (TF) and plans to continue pursuing higher education at the University of the South Pacific. He is studying law. He said it was hard to be without a father. Nayavu Village elder and former secondary school principal Mitieli Vodonaivalu said Lieutenant-Colonel Suliano initially joined a group called CYDA formed by the Reverend Sakeasi Salababa. “I went and got him out of the group when I was the principal of Lomaivuna Secondary School and gave him a teaching post at the school,” he said. However, his fellow villager joined the Republic of Fiji Military Forces and rose through the ranks to become a Lieutenant-Colonel. Mr Vodonaivalu said Lieutenant-Colonel Suliano was a hero and had made the village, the RFMF and the nation proud. Former teacher and national 7s manager Epeli Lagiloa described his nephew as a dedicated and hard worker. He said Lieutenant-Colonel Suliano always carried out his duties with a smile. Lieutenant-Colonel Jeremaia Tuikoro, who presented the RFMF’s eulogy, said Lieutenant-Colonel Suliano was a faithful man. “He was a good leader and respected and was well respected by all,” he said. He described Lieutenant-Colonel Suliano as someone who stood by his ideals and remained loyal to the Constitution. “He was someone who had a jovial and sometimes comedic character and someone whom I know loved his children dearly,” he said. Lieutenant-Colonel Suliano, he said, was spirited and determined when it came to work, but remained a modest man to the end. The decorated soldier was born in 1964 and was studying at the Chinese Military War College in Beijing at the time of his unexpected death. The funeral was attended by Prime Minister Voreqe Bainmarama, Attorney-General Aiyaz Sayed-Khaiyum and Cabinet ministers, RFMF Commander Birgadier-General Mosese Tikoitoga, Fiji Corrections Service Commisioner, Lieutenant-Colonel Ifereimi Vasu, former Government minister and senior RFMF officer Pio Tikoduadua and Assistant Commissioner of Police Rusiate Tudravu.